Have you seen our Paws Fountain Pen by Retro 51? Last April, iPenstore launched a Kickstarter project as a way to fund the production set up costs for Retro 51 to make the first batch of 500 pens and the cost to produce the mold for the custom designed Paws rollerball pen. Kickstarter is a crowd funding site that helps creators find the resources and support they need to make their ideas a reality. The project was overwhelmingly successful with 100% funding reached in just over a week! Based on the spectacular results of the Paws rollerball pen, we worked with Retro 51 to produce a matching fountain pen, which was also successfully funded on Kickstarter last October. We selected Retro 51 to produce the pen for us because of their outstanding history of producing top quality, highly collectible pens.The Paws fountain pen is made with a brass barrel and finished in antique stonewashed pewter. The dog paw prints are acid-etched into the barrel. The custom-designed clip is in the shape of a dog bone. To complete the design, a paw print has been added to the top of the cap. This fountain pen features an iridium-tipped steel Schmidt fountain pen nib offered in Broad, Medium and Fine. It includes one converter and two black ink cartridges.The pen comes gift packed in the iconic Retro 51 tube packaging. Accepts the international-size ink cartridge or push-in converter for bottled ink (both included). Wanting to play our part and contribute to a wonderful organization, we donated 5% of the total funding collected from the Kickstarter campaign to our local Humane Society of Huron Valley. In addition, 5% of all sales of the Paws pen on our website, on Amazon, and on eBay are donated to the local Humane Society. 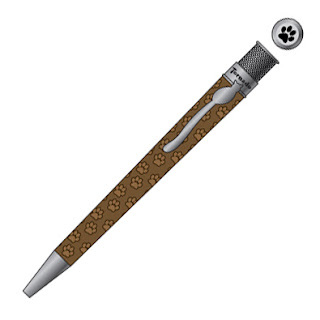 Now in the works...a Cat Paws Rollerball pen! The Cat Paws pen will have the acid etched paws on a copper barrel and a custom designed Cat Clip! We are expecting to have the pen ready for Kickstarter by the end of April. I have this pen in the fountain pen and it is a dream to write with! I now can't wait for the paws cat one to come out in the fountain pen! I recommend this pen highly! It is my "go to" pen and is used every day!